Blackburn Hawks score away at Solway wearing their special "Cup" shirts. Solihull Barons moved up to 3rd place in the Moralee Conference table on Sunday evening after a 6-4 win over Midlands rivals Telford Tigers. The Tigers had previously occupied 3rd after a 6-1 win at home to Sheffield Spartans on Saturday. And now drop into 4th. The Barons outshot the Tigers 54 to 33 but found themselves 1-3 down at the end of the first period. They pulled back to lead 5-4 early in the 3rd period but the result was only secured with an empty net goal just 2 seconds from time. Blackburn Hawks hammered bottom team Sheffield Senators 12-3 on Sunday night – firing an incredible 89 shots on Mark Hartley’s net - and remain top of the table still unbeaten after 9 games. 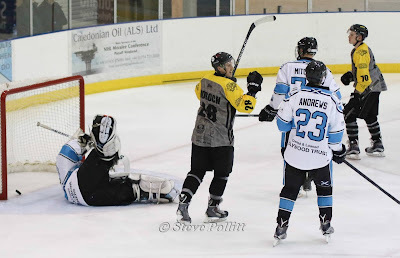 They also won 3-8 away at Solway Sharks the night before in the NIHL North Cup. Second place Whitley Warriors remain in touch with the top after their 6-1 win away at Sheffield Senators on Saturday keeps them two points behind the Hawks, albeit having played one game more. The other Moralee game of the weekend saw Billingham Stars win 1-3 away at Sutton Sting to pick up their 4th win of the season. Last season’s runners up remain in the bottom half of the table, 4 points drift of the play off places at this early stage of the season.